A recent suspected teardown, at 1923 S Allport in Pilsen (25th Ward, 19th place for teardowns from 2006 to now). The demolition permit was issued August 7 and the new construction permit was issued August 5. The new building will have an increase in density, with three dwelling units. Photo by Gabriel Michael. From Wikipedia, a teardown is a “process in which a real estate company or individual buys an existing home and then demolishes and replaces it with a new one”. You can find suspected* teardowns in the building permits data on Licensed Chicago Contractors by looking for demolition permits and new construction permits for the same address. I limited my search to situations where the demolition permit was issued within 60 days prior or subsequent to the new construction permit. This shows properties that have a quick turnaround (thus more likely to get built). I didn’t want to include buildings that may have been demolished one year and got a building two years later. The number for teardowns decreased dramatically as the economic crisis approached. There were 1,717 suspected teardowns in Chicago distributed across 57 community areas (of 77, whose boundaries don’t change) and 45 wards (of 50, whose boundaries changed in 2012). West Town, Lake View, and North Center share top billing, with the most teardowns each year, but Lake View was #1 for seven of 10 years. Other top five community areas comprise Logan Square (thrice), Lincoln Square (thrice), Bridgeport (twice), McKinley Park (once), and Near West Side (once). From 2012 to current, the most teardowns occurred in Wards 32 (Waguespack), 47 (Pawar), 1 (Moreno), 44 (Tunney), and 43 (Smith). All of those wards include parts of the top three community areas mentioned above. The sixth ward with the most teardowns in this period was 2 (Fioretti) but this boundary no longer represents any part of the pre-2012 boundary that covered almost the entire South Loop. That means Ward 2 is now covering the west side. Additionally, the 2nd Ward made sixth place with 28 teardowns and fifth place, the 43rd Ward had 60 teardowns. The South Loop, represented by the Near South Side community area, has had 0 suspected teardowns from 2012 to now. There was one teardown in the entire time period, where a three-story commercial was demolished at 1720 S Michigan Ave and replaced with a 32-story residential tower. 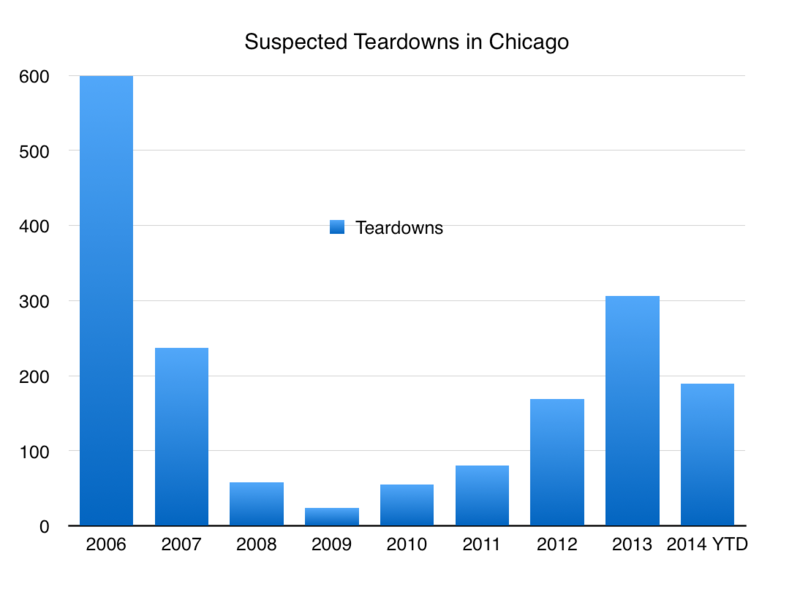 What else do you want to know about teardowns in Chicago? I use “suspected” because it’s impossible to know from the data if buildings were actually demolished and constructed. Download the data as CSV for yourself.